Millions of people suffer from mild, moderate or severe neck pain every year. Many of them are enduring chronic, lasting pain and try in vain to combat it with run-of-the-mill OTC medicine like aspirin or ibuprofen. Needless to say, the relief is fleeting, if anything at all. That’s not how to treat neck pain. Let’s back up and talk about what neck pain is. When the neck muscles are strained from poor posture from leaning over your computer, hunching over your desk at work, sleeping in awkward positions, a car accident, a sports injury or anything that caused stiffness and discomfort – that’s neck pain. Next, let’s take a look at some symptoms up close. Now, these symptoms may be a one-time thing and perhaps an ice pack or heating pad will take care of it. However, if you’re finding that this pain keeps coming back it may be chronic, and in that case, you need to move on to more advanced medical treatments. Physical therapy. Posture correction, neck-strengthening exercises, and alignment techniques can help ease your discomfort and potentially stop future pain. Transcutaneous electrical nerve stimulation (TENS). This technique employs the use of electric currents produced by a device to stimulate the nerves for therapeutic purposes. Steroid injections. A procedure where steroids are injected into the nerves of the neck to stop their ability to send pain signals to the brain. This is an effective way to gain immediate pain relief through minimally invasive means. Don’t wait another painful day. Contact Physician Partners of America now or schedule an appointment to be connected with a pain expert who can help manage your condition and get you back to living a full, active life. 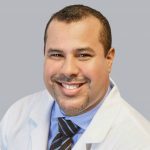 Born and raised in Puerto Rico, Dr. Jose Medina-Sanchez is a pain management physician with the Florida Pain Relief Group.